We apply the cutting-edge dentistry we teach in our US dental courses to our patients to deliver a fast, precise and comfortable experience. Dr. Tulio (third from upper left) with his US dental students. He is the only Mexican faculty at GDIA, a US-based academy for advanced live implant surgery courses. and more when you book with Dayo Dental. An extraordinary smile requires an extraordinary dentist. Dr. Tulio embodies the profile of one of Mexico’s top 5% dentists. He is an international speaker, pioneer of new techniques, and a faculty to US dentists. His patient-first philosophy puts you at the forefront of his exciting and cutting-edge dentistry. Many US dentists get advanced surgery and implant placement training from Dr. Tulio. His dental office is also a teaching facility for GDIA (Global Dental Implant Academy). GDIA is a California-based company renowned for premier dental implant courses. He delivers the intensive courses together with other top American dentists. He has advanced 3D equipment for computer-aided treatment planning and prosthetics (teeth) design. From 3D printers to digital scanners, you get fast, precise and comfortable dentistry. Dr. Tulio is also a pioneer and international speaker for using your own cells (from extracted teeth) to restore your jawbone for dental implants. The technique, performed by few dentists around the world, is a superior alternative to traditional bone grafting procedure that uses donated or processed bone. He has also published this technique in a few dental journals. He is an active dentistry professor at a few training facilities and schools in Mexico. Dr. Tulio also prioritizes service and meaningful contribution to others. He started a non-profit organization that helps hundreds of Tijuana locals get free dental care. Worried about bad dental care? Go to the dentist trusted by the Mexican government to resolve disputes. Dr. Tulio is one of the few with a special designation to review implant cases and decide who is at fault. You won’t be treated like a number. He prefers to see a limited number of patients per week to deliver a personalized service. He does not dictate your treatment plan. He will listen to your needs and provide several solutions that will fit your goals, lifestyle, and budget. Faculty and Instructor to U.S. Dentists. 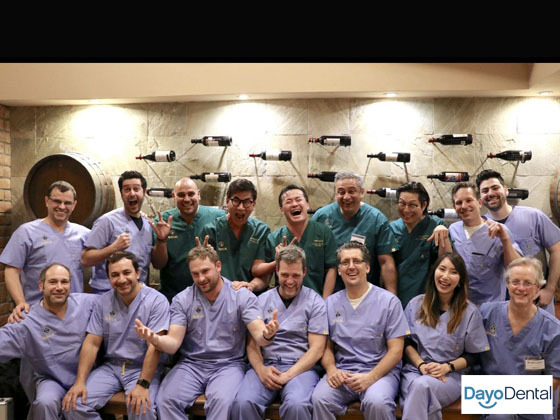 US dentists and specialists travel to Dr. Tulio’s dental office in Tijuana to learn about the latest implant surgery techniques. Dr. Tulio is a faculty, instructor, and director at the U.S.-based GDIA (Global Dental Implant Academy). GDIA is prestigious organization that offers intensive surgical and implant programs to American dentists. He regularly conducts the courses together with top implant surgeons from the US. May 2013 to present. International Guest Speaker - Europe and Asia. Dr. Tulio is an international lecturer and guest speaker for his pioneering work in demineralized and autologous bone grafting techniques. These cutting-edge techniques produce superior results for building bone around dental implants. Daegu, Korea (October 2017). Prague, Czech Republic (December 2017). Former President - Baja California College of Implantologist. The Baja California College of Implantologist covers dentists throughout Baja California. This includes Los Algodones, Tijuana, Mexicali and Cabo. His leadership led to the ever-increasing level of implant dentistry in one of the most prominent areas of Mexico for dental tourism. 2013 to 2016. Dr. Tulio is a part of a team of top dentists that delivers a diplomate course in dental implantology. This comprehensive 6 month course includes basic theory to advanced implant placement techniques. Nucleo Advanced Education, Los Algodones, Mexico. 2018 to present. Unidental Implant Institute is a leading provider of dental implant and surgical training in Tijuana, Mexico. 2018 to present. The dentist performs a full mouth evaluation to create a treatment plan during the first appointment. Consultation is always free for Dayo Dental clients. You just have to pay for the cost of an X-ray or CT scan as required. Consultations normally take 45 minutes to 1 hour. For extensive dental work, you can send your Panoramic X-ray to Dayo Dental. Dayo Dental will send you the pre-clinical evaluation by your dentist in Mexico before you decide to travel. The dentist removes plaque from the entire mouth and polishes the teeth surfaces. Dental cleaning is recommended at least 1-2 times per year. This procedure is completed within 30 - 45 minutes. The dentist performs an extraction when a severely decayed tooth can't be saved. There are two types of extractions – regular and surgical. Wisdom tooth is typically removed using surgical extraction. For full mouth extractions, the oral surgeon performs the procedure with local anesthesia, IV sedation, or general anesthesia. An Extraction is completed in one day. For full mouth Extractions, you will need an appointment at least 1-2 days before the surgery date to take impressions for temporary dentures. A Dental Crown is used to restore a decayed or broken tooth. It goes on top of the tooth. Crowns are also used to give you a smile makeover in cosmetic dentistry. There are several types of crowns. The doctor prefers to use 3 types: E-max Crown, Porcelain Fused to High Noble Metal Crown and Zirconia Crown. Crowns are completed within approximately 4-5 days. Ten or more crowns may take longer. A single tooth dental implant is a titanium post inserted into the jawbone to support a crown. Dental Implants are used to replace missing teeth in the mouth. The doctor prefers to use Nobel Biocare or Straumann dental implant brands. The procedure is completed within 1-2 days during your first trip. After 4 months when the implant post has integrated into the bone, you go back for the abutment and crown that will be attached to the dental implant post. The doctor uses only top brands for the implants. The most common materials are Neodent - Straumann and Nobel Biocare for the titanium post and E-max for the crown. The implant surgery is completed within 1-2 days during your first trip. After 4 months when the dental implant has integrated into the bone, you go back for the abutment and crown that will attach to the dental implant. This package price includes the extraction, bone grafting, implant post and implant crown to replace your tooth. The extraction, bone grafting, and implant surgery are completed within 1-2 days during your first trip. After 4 months when the dental implant has integrated into the bone, you go back for the abutment and crown that will attach to the dental implant. Overdentures Supported by Implants are dentures attached to dental implants. You can detach the dentures on your own to clean them from time to time. It is a popular alternative to regular dentures. You stay for approximately 5 days during your first trip. After 4 months when the implants have healed, you go back to get your new implant supported dentures. Fixed Pekkton Bridges Supported by Implants are fixed teeth attached to dental implants. This procedure replaces your entire upper or lower jaw with a perfect smile. The full arch teeth are permanently attached. Only a dentist can remove the bridge during your regular cleaning and checkup. This is a promotional package price which includes all the extractions, bone grafting, 4 to 8 implants, surgery cost, temporary prosthesis, and the permanent Pekkton bridge. A Pekkton bridge is stronger than a traditional acrylic bridge and lighter than a zirconia bridge. You stay for approximately 5 days during your first trip for the implant surgery. After 4 months when the implants have healed, you travel back for your permanent zirconia bridge attached to the implants. Fixed Zirconia Bridge Supported by Implants are fixed teeth attached to dental implants. This procedure replaces your entire upper or lower jaw with a perfect smile. The full arch teeth are permanently attached. Only a dentist can remove the bridge during your regular cleaning and checkup. This is a promotional package price which includes all the extractions, bone grafting, 4 to 8 implants, surgery cost, temporary prosthesis, and the permanent zirconia bridge. The zirconia prosthesis is stronger and more bio-compatible than an acrylic prosthesis. All on 4 uses 4 dental implants to support a fixed bridge for the entire upper or lower jaw. The doctor uses only top brands such as Neodent Straumann or Nobel Biocare. All on Four is also known as “teeth in a day” because the specialist can install the dental implants and attach the fixed bridge all in one surgery. If you want to replace your removable dentures or redo your smile, All on 4 provides a fast and effective solution. You must have an ideal bone condition to qualify for All on 4. This is a promotional price which includes all the extractions, bone grafting, 4 implants, temporary fixed bridge and permanent bridge (per jaw). The promotional price is also the same for All on 6 dental implants. You stay for approximately 5 days during your first trip. After 4 months, you go back to replace your temporary fixed denture with the permanent fixed teeth. All on 6 uses 6 dental implants to support a fixed bridge for the entire upper or lower jaw. The doctor uses only top brands such as Neodent Straumann or Nobel Biocare. All on Six is also known as “teeth in a day” because the specialist can install the dental implants and attach the fixed bridge all in one surgery. If you want to replace your removable dentures or redo your smile, All on 6 provides a fast and effective solution. You must have an ideal bone condition to fit 6 dental implants in your front jaw. This is a promotional price which includes all the extractions, bone grafting, 6 implants, temporary fixed bridge and permanent bridge (per jaw). A Sinus Lift is performed to increase the bone area on the back (molar) section of the upper jaw. You may need a Sinus Lift on the upper jaw if you need dental implants but don't have enough bone to support the implants. A Sinus Lift takes approximately 2 hours to complete. It is performed using local anesthesia or IV sedation. A Fixed Dental Bridge is used to replace missing sections of the mouth. It is anchored either by existing teeth or dental implants. The price of a Dental Bridge depends on the number of teeth included in the bridge. A 3 unit Dental Bridge, for example, would be the price of a crown multiplied by 3. The approximate prices shown here are for 3-unit Dental Bridges. Dental Bridges are completed within approximately 4-5 days. Multiple bridges may take longer. A Root Canal allows you to save an abscessed tooth. The Endodontist cleans the root of the decayed tooth and seals the area. The price shown here includes the cost of the Root Canal and Root Canal Post. The dentist puts a dental crown over the tooth after the treatment to strengthen the tooth. A Root Canal is typically completed in one day if you schedule an early morning appointment. Porcelain Veneers are thin, custom-made shells of teeth-colored materials designed to cover the front surface of teeth to improve appearance. These are bonded to the front of the teeth changing their color, shape, size, or length. The Veneers can be as thin as contact lenses resulting in minimal removal of the tooth structure. Veneers are completed within approximately 4-5 days. A Denture is a removable teeth replacement for the entire top or bottom jaw. This a common solution for people who want all their decayed teeth extracted. A full Denture takes two consecutive days to complete if you schedule an early morning appointment on the first day. A Partial Denture is a removable replacement for missing sections of the mouth. It is anchored to your existing teeth. A Partial Denture takes approximately 2-5 days to complete. Periodontal Treatment procedures are necessary if you have gum disease. During this procedure, the Periodontist removes the plaque and infected areas under the gums. There are 2 major types of Periodontal Treatments: Deep Cleaning and Osseous Surgery. With Deep Cleaning, the Periodontist uses instruments to go underneath the gums. With Osseous Surgery, the dentist opens the gums surgically. With both procedures, the Periodontist may use Laser to improve the results. The prices shown here are per quadrant. Periodontal Treatment procedures typically take one day. For full mouth Periodontal Treatment, your dentist may recommend separating the upper and lower jaw procedures in two separate days. White fillings are commonly used to repair decayed sections of teeth. Also called resin composite fillings, it mimics the appearance of natural teeth. Most Mexico dentists prefer this type of filling over the traditional silver (amalgam) fillings. A White Filling is typically completed in one day. You have the option of undergoing IV Sedation for major dental surgeries or procedures. Under IV sedation, you are still semi-conscious. However, you won't feel any pain or remember the procedure. An anesthesiologist administers the sedation while your dentist completes your dental work. The dentist typically requires a blood test prior to the procedure. This can be done during your day of consultation. Sedation procedures last between 2-4 hours. A Panoramic X-ray captures the entire mouth in a single radiographic image. Dentists typically take this x-ray to create a comprehensive treatment plan for the entire mouth. This x-ray is typically taken during your consultation appointment. Single tooth x-rays are used to evaluate various sections of the mouth. This x-ray is taken as needed during the course of your dental work. A Night Guard is a custom dental appliance worn to protect teeth from grinding and clenching. After the dentist takes your impression for a night guard, it will be available within the same day or the next day. Braces are dental appliances you wear to align and straighten your teeth. They are performed by an Orthodontist, a dentist that specializes in braces. Braces require regular short trips to Mexico for your adjustments during the course of your treatment. The number of short trips depends on the initial condition of your teeth. Need help to select a dentist or to get free estimate? Option 1: Drive directly to the dental office. Option 2: Park on the US-side of the border and take a 5-minute Uber/Taxi to the dental office.